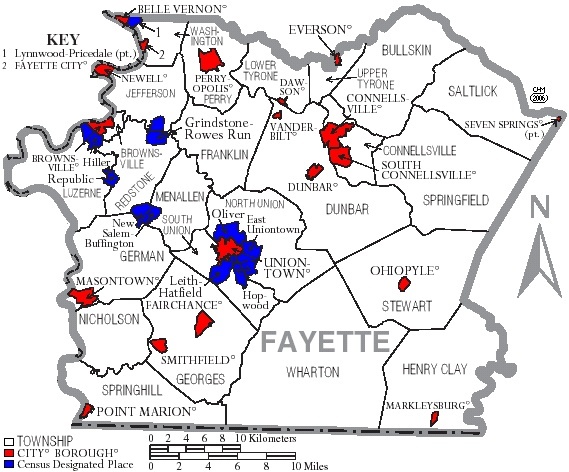 Fayette County was originally part of Westmoreland County. It was created on September 26, 1783, and named after the Marquis de la Fayette. The county seat of Uniontown was laid out in 1776. First named Beeson's-town, it was later renamed to allude to the federal union. It was incorporated as a borough on April 4, 1796, and chartered as a city on December 19, 1913. Looking to further your research in Fayette Co.? Map of Fayette County, Pennsylvania, United States with township and municipal boundaries is taken from US Census website and modified by Ruhrfisch in April 2006.